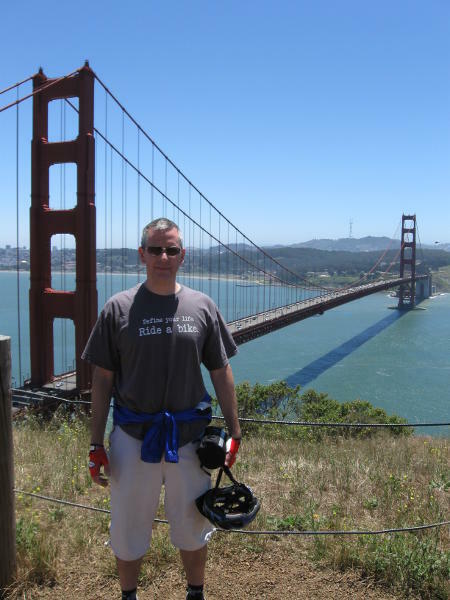 Century Cycles Blog: Define your life - in San Francisco! I just returned from a week-long vacation in sunny Northern California with my girlfriend. Fortunately, the Fog City did not live up to its nickname, and we had clear skies and warm days to enjoy cycling around San Francisco, as well as seeing wine country by bike. Bicycling across the Golden Gate Bridge can be a harrowing experience, but one that should be on the "bucket list" of every cyclist. Imagine the busiest summer weekend on the Towpath Trail, with hundreds of fellow tourists on bike and on foot. Add in 30mph+ cross-winds and a 270-foot drop to the cold water of the Bay below! I had the good fortune of a friend living in town who let me borrow a bike for the day, but if you want to try the ride yourself, there are plenty of bike rental concessions available. They are easy to find near Fisherman's Wharf and the surrounding area. There's no toll or fee to cross the bridge on foot or by bike. You can ride both ways, or take the ferry back to San Francisco from Sausalito, the first town on the north side of the bridge, for about $8. Wow! I got a chill just reading your description of riding across the Golden Gate! What an opportunity. Are you separated from car traffic, somehow?